Our olympic sized trampolines are used by gymnastic clubs, competitions, and even the Olympics. 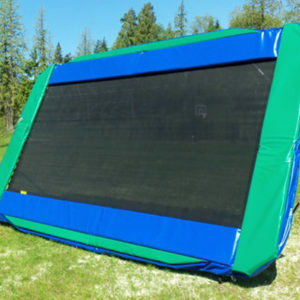 These rectangular trampolines are for the budding gymnast and trampolinist in your family. Help your kid practice in the comfort of your own backyard using these Olympic shaped and sized trampolines. 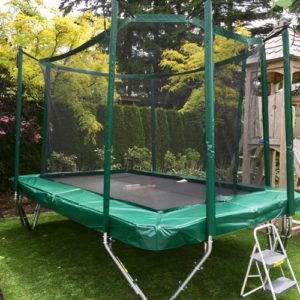 For additional safety, our rectangular trampolines are also compatible with select custom fitted Vikan trampoline enclosures. We also have trampoline repair kits available for sale as well. Built for growing kids to perfect their aerial moves, the rectangular trampoline design with extra long jumping surface gives the preferred bounce and performance area. Vikan’s rectangular trampoline frame with equally-spaced high-performance trampoline springs allow uniform spring-stretch and frame-stress, resulting in a smooth, comfortable bounce. This attention to detail ensures a natural tendency for the trampoline to work the jumper toward the center of the mat, allowing for a safer, more controlled and predictable bounce.